With Penn West, not shown, and 15 Penn Plaza, center, the Empire State Building could be getting some unwanted skyline company soon. Earlier this spring, as part of its plan for 15 Penn Plaza, Vornado Reality revealed plans to reopen the Gimbels Passageway between 6th and 7th Avenues underneath 33rd St. Although the company’s development proposal failed a Community Board vote and is still awaiting an anchor tenant, the City Planning Commission approved the building, and as Speaker Christine Quinn is a friend to developers, a City Council vote next week is all but assured. But if a group of people banding together to protect the Empire State Building’s place amidst the New York skyline has its way, 15 Penn Plaza may not get so high off the ground. The problem is one of height and proximity. Vornado’s new high-rise, located just two blocks west of the iconic Empire State Building, would top off at 1216 feet. The art deco building at 350 Fifth Ave. rises to just 1250 feet before the radio spire and lightning rod reach to just over 1453 feet. The new building, fear landmark preservationists, will radically alter the way the Empire State Building is perceived. As for what’s driving Mr. Malkin, it seems to be a transparent self-interest. He views himself as a guardian of his building’s place in the skyline, and, as such, he is protective of anything that might encroach on that. If there are financial motivations-and Mr. Malkin says there are not-they are not obvious (although he has raised concerns that the new skyscraper would interfere with his building’s radio tower). The Vornado tower and the Empire State Building would compete for two different types of tenants; namely, those willing to pay high rents for modern space at the Vornado tower (banks and the like), and those who can’t. Tenants at the Empire State Building include the FDIC and nonprofits like Human Rights Watch, for instance. As this battle brews, though, and the fate of the proposed development atop the Gimbels Passageway awaits City Council action (and the inevitable lawsuits), the altered skyline could come into play at 8th Ave. as well. As Jeremy Smerd from Crain’s New York York Business reported yesterday, the city, state and Vornado are haggling over the potential sale of 1 million square feet of air rights above the Moynihan Station. With the initial contracts for Moynihan’s Phase 1 approved on Monday, the air rights are the next big issue that must be sorted out. Interestingly, an air rights deal could lead to a quick development at 33th St. and 8th Ave. If Vornado works out a deal, Penn West, a 67-story, 693-foot-tall tower above the new depot, could begin to rise soon. It’s going to get awfully crowded along the 33rd St. corridor soon, and the iconic Empire State Building may soon have some tall transit-related company indeed. Enh, I can’t get worked up over this. The Empire State Building may be iconic, but it was never a particularly attractive building, and the weirdest thing of all is how alone it looks in its neighborhood. It needs some company nearby. So tall as this proposed building? Perhaps not but that’s not my call, nor should it be, assuming it’s privately financed. i don’t see a problem with the new skyscraper. while i love the empire state building, what’s so incredible about it that we can’t build a similar size building near it? nothing will never diminish the value of the empire state building. they’re just trying to add more office space in the vicinity of hearld sq. i say go on with the building, it will compliment midtown well. i agree with rhywun. as long as its privately built, i got no problem with it, being a new yorker for the past 25 years. no one is complaining about more skyscrapers downtown at the WTC, right? yeah yeah, i get the whole tragedy and 9/11 concept, but instead of two big buildings they’re building, what, 5? (don’t hold me to this) yeah, build it. we need more skyscrapers in new york. the empire state building looks so lonely. it needs brothers and sisters. The ESB was taller than the Chrysler, but somehow that didn’t make people stop it on the grounds that it interfered with the skyline. I’m not sure I get your point. (1) They were built at nearly the same time (a year apart in terms of when they were finished), which meant that the Chrysler had little time to acquire any real claim to any part of the NYC skyline (indeed, the Chrysler was only the tallest building in the City by a few feet, as its builders surreptitiously constructed the spire inside the building to prevent the builders of 40 Wall Street from knowing the full height planned for the Chrysler). (2) They aren’t near each other at all. They are 10 blocks apart, which makes an enormous difference when looking at NYC from afar (the “skyline” view so to speak). I don’t necessarily think the new tower shouldn’t go up, but the ESB defines the NYC skyline in a way that no other building has (save for maybe the WTC) for 80 years. That has to count for something. The point is that the tallest building status changes with time. In a building boom, such as the 1920s or the 2000s, the record will often be broken. There’s nothing wrong with that; skyscrapers are perfectly in place in Midtown. Nobody’s plopping a 400-meter tower in Maspeth. I think you missed my point. I don;t care about the tallest building status (Dubai can have that). I care about the integrity of landmarks. The ESB isn’t just another tall, cookie-cutter skyscraper that went up in the past decade– it is the symbol of New York and deserves special treatment– whether that treatment means that this building shouldn’t be built is up for debate. The ESB and the Chrysler are symbols, but they themselves overshadowed earlier symbols. Now, I personally think they look better than both the older buildings, built before the zoning code, and the new buildings, made of glass in modernist style, but I also think that there’s a beauty to a city with multiple architectural styles right next to one another. The city shouldn’t be a museum to the styles and the preferences of the 1920s. It’s not about architectural style, it is about obscuring the ESB from view. You say that ESB “overshadowed” old buildings, but that isn’t correct in the sense with which we are using the term. Sure, the ESB “overshadowed” the Woolworth building, but it was miles from that building and each building could still be seen from miles away in most directions. I don’t mind the “newness” of the proposed building. I mind its height. If they wanted to build a 1200-foot tower on 42nd Street, or even 28th Street for that matter, it would be a different issue. Let’s build a mosque in it. Seriously, though, I fail to see how another tall building really takes away from the ESB. There will be plenty of striking views of the ESB left if another building goes up. Jersey residents should come to the city if they want to see the ESB. I would think, even from Jersey, you would still see the ESB from many angles. But, as long as Jersey is happy…. You already cant see the ESB from upper Fifth Avenue anymore, due to that anonymous eyesore at around 40th & 5th. It would be a shame if the iconic Empire State’s citywide view was blocked further. The ESB is immense but still has a human scale due to its setbacks and massing. It doesnt loom over the surrounding nabe despite its bulk, unlike so many new speculative skyscrapers. The Bank of America bldg at 43rd & 6th is particularly egregious in this regard, going straight up for dozens and dozens of stories, from the 60-ft-wide W. 43rd, casting Town Hall in perpetual gloom…..
Fail with whiny conservationists…The London Eye is not much farther (~1500 ft) from Big Ben than 15 Penn Plaza from the Empire State Building and eclipses it by 40m. Meanwhile, the Eiffel Tower sits smack dab in the middle of a park, surrounded by buildings limited in height by legal restrictions. The Empire State Building, meanwhile, sits in the middle of some of the highest-valued commercial real estate in the world; the arguments Malkin uses with regard to these two other worldly landmarks are stupid. Why not protect the skyline around ALL landmarks in New York? Reductio ad absurdum. Because we are trying to balance preservation of certain landmarks with the desire to have a robust commercial real estate market. Post-9/11, no building in the City approaches the ESB’s status as a global icon (and I think you’d find that most people felt the ESB was the paradigmatic symbol of New York even when the Towers stood (the Towers being more of a national/world symbol)). The ESB is, like Grand Central Terminal, a one-of-a-kind treasure. Now you still may think we should build around it, and that is fine, but making an argument for preserving its position on the skyline doesn’t mean that you need to preserve every building’s position. the london eye and big ben are also separated by the thames and you can see through the eye not to mention that they are not in line with each other but and an angle. you don’t really ever experience big ben and the london eye in the same view. The Twin Towers were more recognizable than the Empire State Building around the world. They defined the NY skyline – it was unmistakable when seen in photos. And they’re gone. So to make a claim that the ESB must remain isolated to maintain the famous skyline is ridiculous. The sacred skyline notion is over. I’d also love to see the Gimbel’s passageway come back. Agree with your comment about the Twin Towers. Since when did our skyline become ‘stuck in time’? I thought that our skyline is ever-changing and morphing? When the Twin Towers were built, was there a fuss that it would block the views of the Woolworth Building or somehow diminish it? And that’s just around the corner. And now there is a very tall residential building erected downtown (near the Brooklyn Bridge). Is this why Dubai now has the tallest building in the world instead of NYC? I hope it does not detract from the tragedy of the deaths on 9/11 to offer my opinion that the Twin Towers were downright ugly, a pale pair of monstrosities looming over a vacant windswept plaza. They were placed awkwardly on the edge of Downtown, making that skyline appear off balance. The view from the Harbor made me thankful that the foundations reached bedrock, because if on the edge of a barge, they would have capsized into the Hudson. 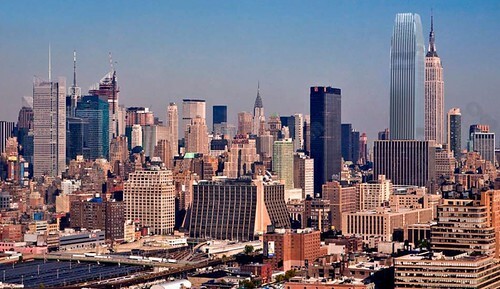 Only after a couple or three decades with the construction of the mid-sized towers of the World Financial Center did the Twin Towers appear more normally toward the center of the skyline where the tallest buildings in any city have almost always belonged. Architecturally both the Twin Towers and the Empire State looked very much like other skyscrapers of their periods, only more so. The Art Deco ESB went up when zoning rules required setbacks to allow light and air to the streets below as well as to neighboring structures, but it was the tallest. The Modernist Towers were boring boxes of glass and stone-clad concrete, but they were the tallest. Of course, it was a tenet of the Modernist movement that its new buildings should strive to look ‘New!’ for newness sake, and by contrast, to make existing surrounding buildings look old, presuming that there was something wrong with being old. 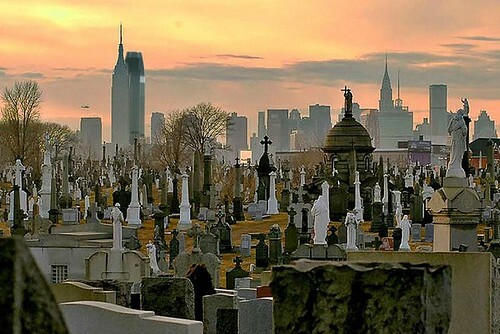 If that philosophy is expressed with a monstrosity less than a block away from the old, time-tested, and classic icon of skyscrapers that is the Empire State, then we will surely regret it. We risk replicating the architecture of the Madison Square Garden and of the 1 and 2 Penn Plaza buildings adjoining it with an enormous structure that will fuse the imperative to “build it cheap so we can make more money” with the philosophy that it’s a good thing to thumb the nose stylistically at older neighboring buildings. And if the best that can be said for 15 Penn Plaza is that it will look very much like other skyscrapers of this period, only more so because it is taller, we’ll surely regret it being built to an enormous height. If thery’re going to do this, couldn’t they at least put up an interesting building? If Malkin want to preserve the skyline around the ESB, all he needs to do is give Christine Quinn more money than Vornado gives her. Whatever happened to the appeal of skyscrapers in the outer boroughs? Is the Citigroup Building in LIC destined to stand like an orphan? As someone raised near Chicago by a CHicagoan parents, I can say that it’s really easy to add new tall buildings to the skyline and not only not interfere with the skyline in general, but make it even more interesting and iconic. The first time I came to NYC, I was shocked at how dull the profile of the skyline was. The location around Penn Station is incredibly transit rich and will be even more so in the coming decades with improvements in the works, there is no reason that this area shouldn’t have a collection of tall buildings. There’s certainly space around Penn Station for a collection of tall buildings. I can support the proposal for Penn West, a 67-story tower over the General Post Office/Moynihan Station. After all, it will be only 693 feet, little more than half the 1250-foot height of the Empire State, and three full blocks away from it. Let’s have lots of 700-foot towers. No problem. I am troubled by the suggestion to put up a skyscraper barely a block away from the iconic Empire State that will soar to 1216 feet, only 32 feet shorter than its older rival. And it’s not a good omen that the developers wouldn’t even spend a few bucks for renderings of proposals that would be architecturally outstanding. If they won’t even pay for beautiful renderings, will they spend for a top architect and, more importantly, for a top quality building? I fear we are rushing toward another giant glass-covered filing cabinet in the sky that will spoil the unique status of a graceful and cherished landmark. There’s nothing good about hiring a top architect. Top architects are more interested in building monuments to themselves than in building an aesthetically pleasing building. OMG, tall buildings in Midtown! Oh the humanity!! Never heard of such a thing. The title here is a little misleading, isn’t it? The ESB owners’ objections don’t have anything to do with transit, do they? Since when did NYC become a big, sacred museum? We’ve all seen the skyline change, with additions and deletions galore. The ESB is indeed iconic, but that doesn’t mean we have to put a 10-block wide velvet rope around it. The west side of 5th Ave could definitely use a bit of architectual sprucing up. I say, let ’em build it. That’s exactly what I ment in my post above. Do the highrises on W 57th & 59th like the Crysler Building overwhelm Central Park? The Penn Station area needs a lot of work & everyone knows it. So here’s something to get started with. Now is it architectially pleasing? That will always be up for debate. WTC always amazed me the way it was constructed, but the mall portion leeding to the subway & PATH was a bit underwhelming & perhaps a bit depressing as well. However as a retail complex it sort of did what it was designed to do, bring transit riders, office workers & tourists into the restaurants & shops.